I love seeing the homes of great designers and the spaces where they work. When I went through my favorite blogs this morning Julie from SHELTER stopped me right in my tracks and I could not go on till I shared these amazing pictures. They are from her home and they are beautiful and everything I want in my own space now! I just had to wipe the drool from my desk for the second time this morning. Don't you just want to move in right now? I do, and she just happens to live North of Boston, perfect!! Go over to Julie's blog to see more HERE and tell her I sent you. love! she did such a great job and i love that bright chair in the last pic! I immediately added her to my blog roll when I saw her home this AM. What incredible work. The glimpses are beautiful aren't they? these photos are great inspiration - thanks for sharing! i have the 'for like ever' poster + it's one of my favorite things! I love those white chairs!! Oh Yes!! I am completely with you on, I adore her style and home! Love it!!! All of it!! Love the lamps on her dresser. That wall color is great, too. Similar to what I want to do in my master bedroom. Oh wow! I'm loving all of these. I'll have to check out the rest of her work. I love all of the vignettes. Gorgeous. eye candy indeed...there is a lot of inspiration in this post. Love it. I'm with you, Linds! I love all the details and color in her home. 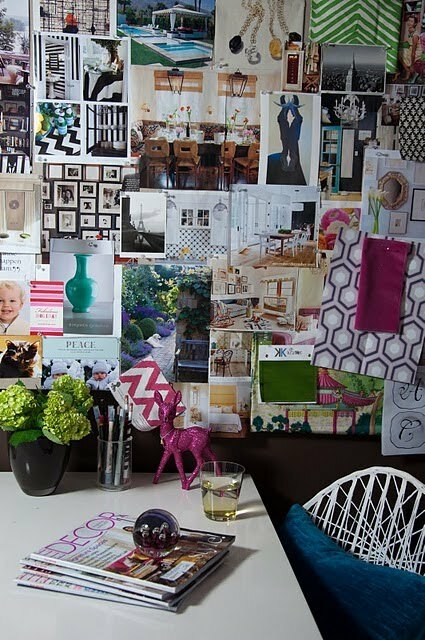 I want a giant inspiration board so badly, I can taste it! Candy for sure! These images are officially on my inspiration board! Amazing home! 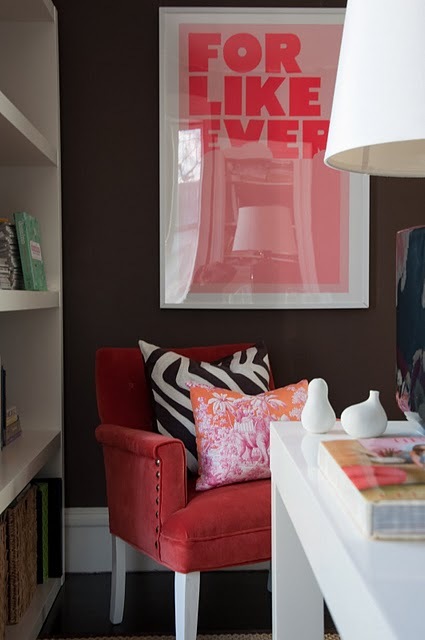 I love all the pillows she has around her house and the print "for like ever" so cute! Gorgeous!! This is how to do color right. It's so bold but not overwhelming. i saw that too and about poo'd myself. Thanks for the comment!! PS I could totally use some of your fabulous advice... I'm putting together my wedding registry and am going a little crazy... check out my latest post. Thanks!!! definately eye candy! love the last one! 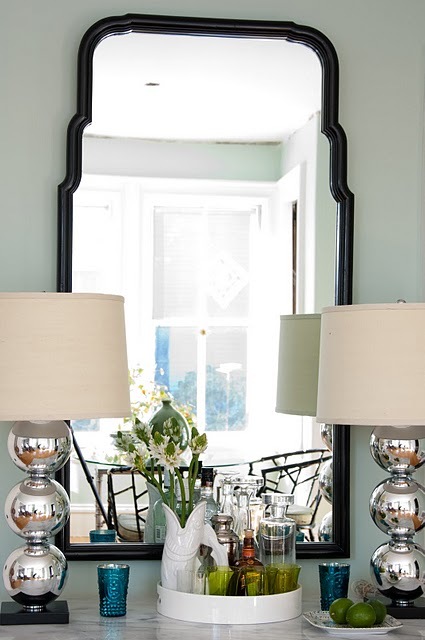 Her house is great... and it looks like your style! these are beautiful. 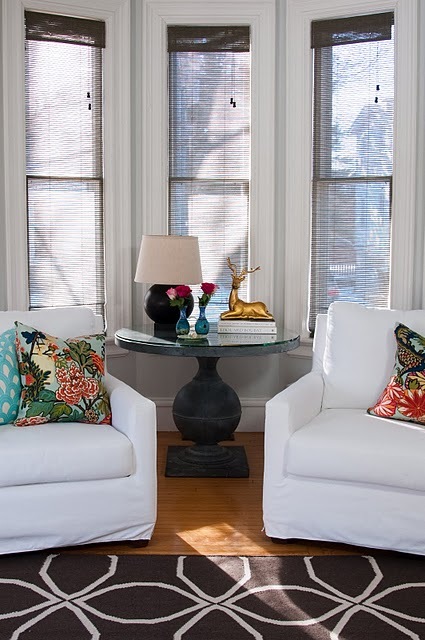 love the round table with the deer on top. Okay, I think I hate her. A lot. In that "I-hate-her-because-I'm-super-jealous" way. 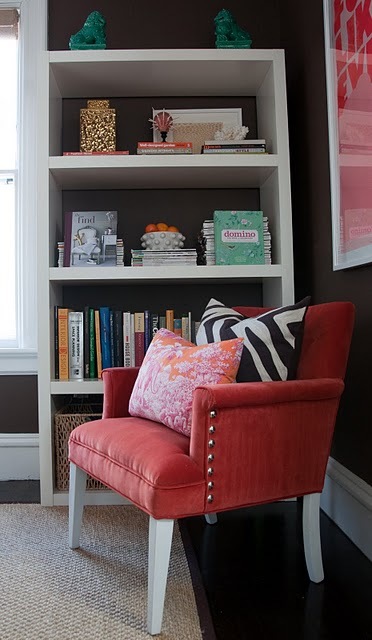 I love her use of color - I'm now trying to figure out where in my house I could use that orange and pink toile fabric. And whether or not I could paint the whole house silver sage and set out limes, like in her bar area. Thanks so much for the mention Lindsey...Hope you are well.